I'd like to propose the following as a species - Faerie Dragon. EDIT: I've updated the "Details" portion of the post to reflect the current state of the species (as of 1.8-beta, 26 March 2018). The details of the original proposal are still included for any who'd like to see how it's changed. Introduce a species that clearly speaks to spellcasting fantasy and is worthy of placement in the "Simple" category. After encouraging as many friends and co-workers as I could to play Crawl (we filled 9(!) teams in the 0.21 tournament), I noticed that many of them expressed a desire to cast some spells after they got their fill of MiBe and similar, but for many reasons the playstyle of "killdudes with spells" is initially much more difficult than melee counterparts. Although I'm certain this will remain true, I noticed a lack of a species in the "Simple" category that clearly serves to guide players into spellcasting by directly speaking to that fantasy while providing bonuses that can help players go through the motions. In my own experiences and in speaking to others, Crawl really "opens up" to a player and reveals its potential for endless variable fun experiences as soon as they become more comfortable with spells. My ideal outcome would see Faerie Dragons as very clearly strong at killdudes with spells, especially on earlier floors, but with meaningful drawbacks such that they don't play exactly the same as other species and aren't necessarily better off throughout all stages of the game. Faerie Dragons are a small species of magically-attuned dragonkin with so few living members remaining that many believe them extinct. They are very intelligent, but are known to be brash and often overconfident when confronted with danger. Their shimmering scales and bright wings are attractive, but have proven to be more bane than boon by drawing the attention of the Dungeon's denizens. Most Faerie Dragons welcome confrontation and favour the use of destructive spells to dispatch those who would challenge them. Their natural attunement to magic reduces the MP cost of spells and negates any hunger generation. Their scales to shimmer with energy that repels incoming attacks. They are capable of continuous flight and gain a bonus to evasion while doing so. Their small size furthers their ability to be evasive, but they're frail and cannot wear any form of body armour. Faerie Dragons are a tiny species of magically-attuned dragonkin with so few living members remaining that many believe them extinct. They are very intelligent, but are known to be brash and often overconfident when confronted with danger. Their shimmering scales and bright wings are attractive, but have proven to be more bane than boon by drawing the attention of the Dungeon's denizens. Most Faerie Dragons welcome confrontation and favour the use of destructive spells to dispatch those who would challenge them. Their natural attunement to magic reduces the MP cost of spells and causes their scales to shimmer with energy that repels incoming attacks. They are capable of continuous flight and move more quickly than most species while doing so. Their tiny size makes them exceptionally evasive, but they're extremely frail and are restricted from wearing most armours. Last edited by Realz on Monday, 26th March 2018, 10:06, edited 3 times in total. I'm quite excited by everything you've done here, Realz. I happen to know you've spent a fair amount of time playtesting and thinking about balance but you haven't included any of that in your post. Could you tell us a bit about the idea behind -1 spell costs and about how you've found Faerie Dragon to play out in practice? Can you please add increased mana regeneration as intrinsic mutation? Otherwise I don't see how it's easier than Te or DE. When you run out of MP you still can cast level 1 spells for free but they don't do much after early game and having those melee/launcher abilities at -2 and worse means it will be even more retreating and luring especially with -stealth. Edit. I mean it's like a newbie trap currently: much easier early game and much harder late game than DE/Te. Maybe AC/SH bonus should scale with experience like for Na/Gr. I started with some wackier ideas that didn't pan out, like a scales mutation that was somewhat similar to qazlal's reactive defenses, but I found I was trying to cover too many bases for the species and and of course it's not terribly interesting to be good at everything. The biggest feature (as Ultraviolent4 mentioned) is the -1 cost for spells, which pretty radically changes what you can do in the early game, and turns something like Magic Dart more into Swing Axe... it's intentional, but the bonus becomes less significant as the game goes on when the spells you want to cast get increasingly more expensive. Eventually the flat bonuses (MP cost reduction, flat AC/SH) that were so incredible early on aren't better than a Deep Elf's (comparatively) extra HP, larger MP pool, bonuses from armour slots, and good Stealth. Just having -30% HP (without spriggan speed) and weak Stealth makes some of the challenges encountered mid-to-late game play out differently (read: often worse) than on many other species. For now the poor scaling is intentional, as I responded to feedback requesting they not simply be "better Deep Elves", but of course I don't want them to drop off a cliff by the mid-to-late game, just 'slow down' a bit and let other species catch up in terms of relative character power. So far it's felt pretty good, but it's possible that aspect could/should be improved. I don't know that I agree that it's a newbie trap, since I don't believe a newbie's experience is bad unless they win the game. I've had multiple discussions with people absolutely BEAMING that they got their first caster to Lair. Last edited by Realz on Tuesday, 13th March 2018, 08:29, edited 1 time in total. I think it contradicts to "Why?" section from OP. If your intent was to create a simple species like MiBe in magic, then it really should be "better Deep Elves". Currently it is strictly inferior to late game Draconian IMHO. Edit. Don't get me wrong, I would happily play the species, I just think it is more suited for experienced players than for new ones. One thing I tried because I was similarly concerned, was to move them to "Small" size instead of "Little", and thusly have -20% HP (instead of -30%) and access to boots+gloves... but I changed it back because it felt bonkers. If it ends up being a legitimate concern, I could see simply going again to -20% HP (but no size change), assuming it could make sense that any dragonkin would be more robust than a Spriggan, despite similar size. Based on the frequently expressed complaint that nothing in crawl is as difficult as the early game, this would be a welcome addition, and I share Realz' opinion that it would help to attract new players, in the same way as Gargoyles did when they were introduced some years ago. VeryAngryFelid wrote: I think it contradicts to "Why?" section from OP. If your intent was to create a simple species like MiBe in magic, then it really should be "better Deep Elves". Currently it is strictly inferior to late game Draconian IMHO. It seems like you're equating Simple with "strong". Based on my reading of the species selection list, the categories are more a (sometimes arbitrarily-weighted) mixture of strength/difficulty and how straightforward a species is to play. Centaurs and Deep Dwarves are Intermediate rather than Simple even though both species are extremely strong. That's presumably because their playstyles aren't so straightforward for a noob (DD can't heal like any other species can and Centaur requires lots of kiting). Tengu is Intermediate rather than Advanced even though it's one of the weakest species in the game. Presumably this is because their playstyle is sufficiently straightforward enough to keep them out of the highest category. Demigod is an Advanced species even though it's extremely straightforward to play. Certainly, they are even more simple in approach than a Human is because they don't have to worry about any god mechanics at all. It's not apparent to me that a Simple version of a Deep Elf must necessarily be stronger in terms of ultimately winning the game. It could be the case that they are more straightforward so it's easier for a new player to learn with and get the fundamentals of spellcasting down. If that's not true I could say something like: "if your intent is to create a simple species in melee, MiBe wouldn't qualify because it really should be "better Deep Dwarves". That's obviously not correct. To take the proposal in front of us, a new player trying magic for the first time won't have to worry about managing their MP on this character anywhere near as much as a Deep Elf would in the early game. Perhaps that means it's more simple for them to play even if the species ultimately becomes more difficult as it heads into late-game (a stage they're unlikely to reach anyway, whether playing FD, DE or Dr). You have to try to remember what it's like being a noob who would actually care about and rely on the species selection categories. Those sorts of players are usually trying to learn the basics of the game much more than they are trying to win it. Well, one of my points is that this new species is simpler just early game, later it will need to retreat a lot instead of using melee or robe of archmagi for extra spell power. I agree it depends on what we think of "simple". Is Felid simple? You don't have to choose body armour and even aux armour or think about spell hunger. Is Mummy simple? You don't have to think about potions, spell hunger and poisonous monsters. Is Formicid simple? You can ignore some scrolls, paralysis and don't have to choose between 1h and 2h weapons. If "simple" means just "no weird mechanics", then the new species is not that simple, it has a long list of intrinsic mutations and limitations. As far as I know, we've never been given criteria for the categories. We just have to infer. I don't think the exactness matters too much. Just try to think about a noob picking. What do they care about when choosing a Simple species? I'd guess the biggest consideration is that everything works out of the box: I pick my character then I start tabbing/spell slinging. Do I enjoy my experience/learn anything or do I just die because I have no idea how to draw enemies back one at a time so I can manage my MP with small engagements? That's why I suggested to give mana regen. Perhaps I'm missing something, but both the goal and the implementation of the species look quite similar to those of Deep Elf. DE is probably even better for newbies than this race. Goal: DE fills the "killdudes with spells, especially in early game" niche quite well. In the early game, DE gets good spell power, low failure chance, and rarely runs out of MP. Implementation: DE has -20% HP, extra MP to start with, good magic apts and bad physical apts (except dodging and stealth). These aspects seem quite similar to the proposal in the OP. I don't understand several aspects in the OP. The +6 AC/+6 SH, together with -30% HP in the proposal -- this doesn't make much sense to me. 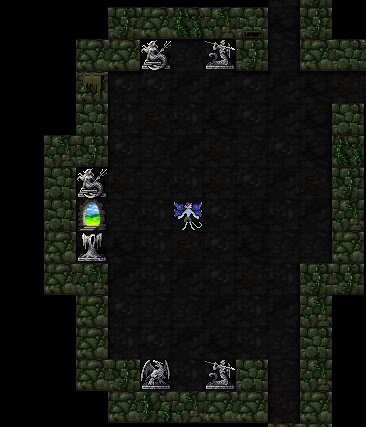 Also, since spellcasters wear light armour, they will benefit from dodging and stealth -- but this race has bad stealth. As an anecdotal data point: my first win ever was with a DE of Vehumet. It's quite fun to play for a new player, since new players overtrain spellcasting anyway, so you have lots of slots to learn lots of spells. Bikeshedding the name to Pixie or something not a dragon to avoid any confusion with draconian and FDS. Rpois or regen. -30% hp early at normal move with restricted armor really wants some way to not see an early adder/blowbold and fall over if this is intended for new players. I don't know if anything there can be useful. The more relevant difference I see is that, back then, I proposed a +30% bonus to MP total. It has the disadvantage, compared to your idea of -1 MP cost, that it doesn't make lvl 1 spells free. However, it has the advantage of having an effect that last during the whole game, while you can expect that lvl 1 spells will be left behind before Lair. The two mechanics, however, don't need to exclude each other. Starting off with the -1 MP mechanic and then gradually adding 10% MP total at e.g. lvl 6, 15, 24 would give a straightforward advantage during all phases of the game, totalling at 30% bonus MP. The one change I would recommend is giving more HP, because HP penalties are IMHO very unforgiving and quite hard to overcome. Gargoyle is the exception, but Gr has some HUGE AC bonus (as well as torment resistance, poison immunity, flight, rElec, and so on). But I think that magic species having generally less HP than other species is one of the reasons why they are hard. Actually, is a HP penalty really needed? I personally like the idea of having a small race that isn't mean to be played stealthily for once. I wish it was more significant than a mere Stealth modifier however, instead, I would propose to increase the noise every spell does when playing this race. I agree that a small but non-stealthy species sounds interesting. But I also agree it looks a lot like Deep Elf. Stronger early game/worse late game is a nice concept, because if you can get past Lair your character generally has become fairly well established and is much better at surviving, and having powerful spells online can get you through things; but it shouldn't be extreme to where the species later starts to resemble a felid without extra lives. Having stronger spells and nice EV won't change that you have the durability of wet paper; do we need another "hope you find statue form" species? I echo the sentiments that the HP penalty should be less cruel. Consider that the race ALREADY has much less AC and can't wear most equipment. That's a lethal combo. They'd pretty much need a speed bonus, and then they look even more like felids and spriggans. Instead, they need more HP and/or more AC, whether it's opening up a couple equipment slots (by moving up to small) or by scaling up their innate AC bonus over time. Playing a perpetually <10 AC species with bad HP requires tedious levels of care and we have several species for it already (most of which get Fast because it's so bad), and makes Deep Elf look strictly more appealing as early in the game as Lair where tons of things can really rip your low-ac face off. As for MP, I like the suggested idea where they start with -1 mp cost, and slowly gain levels of the High MP mutation to keep the flow going all game. They're already feeling the pain enough later in the game. Gaining MP regen at mid-level could work instead, maybe in combination with a lesser high mp mut. Strong MP flow seems to be one of the parts of this concept that makes the species more unique. Another thing that might be interesting and differentiating is later gaining an ability to toggle Wild Magic. Their late game will be painful regardless due to fragility, this could grant a boost to spellpower when the species needs a little oomph, without forcing them to deal with the casting penalty when they don't want to. I was initially skeptical that we needed this when we already have DE, but after thinking about it, having a race that can ALWAYS kill dudes with magic even in the early game makes for a great beginner friendly race. It's like how SpEn is the archetypical and most popular stabber - it can easily retry fights by running away, and is too flimsy to easily win without stabbing things, and everything about the presentation of the combo meets your expectations and drives you towards playing in the way you expected to. In relation, Faerie Dragon can always blast things with spells, but it's not OP since it's just magic dart or whatever, but it means that you aren't incentivized to pick up a quarterstaff and learn to hit dudes or pre-emptively kite everything to conserve MP, which is the 'unintuitive barrier' that makes casters harder to pick up than smashy dudes for new players. And given the huge drawbacks it has otherwise, it certainly isn't an OP race, similar to how Gargoyle gives you security with various resistances and protections but remains balanced due to the HP drawback. 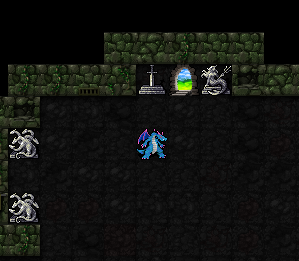 So I'd love to see this in Crawl. I like the idea in general although I'm not sure if -1 MP is a good idea. Well, I love the idea, but it might be too radical for vanilla. +30% MP and high spc aptitude might be a better approach. * They mostly serve to make the species better at things it was already good at and bad at things it was already bad at. This isn't great design. * -4 is really low. * My suggestion: fighting -1, melee -2, ranged -3, spc +1, spell schools +1, invo/evo -1, stealth -1. Maybe a couple of skills can get unique aptitudes, like -1 for sbl and +2 for spc. Yeah, the spellcasting aptitudes are a bit too high and the melee a bit extremely low; they're already ill-suited, it doesn't need to be utterly ruled out. -1 mp cost gives the species a nice unique touch that makes it very beginner friendly though, which is the main concept. 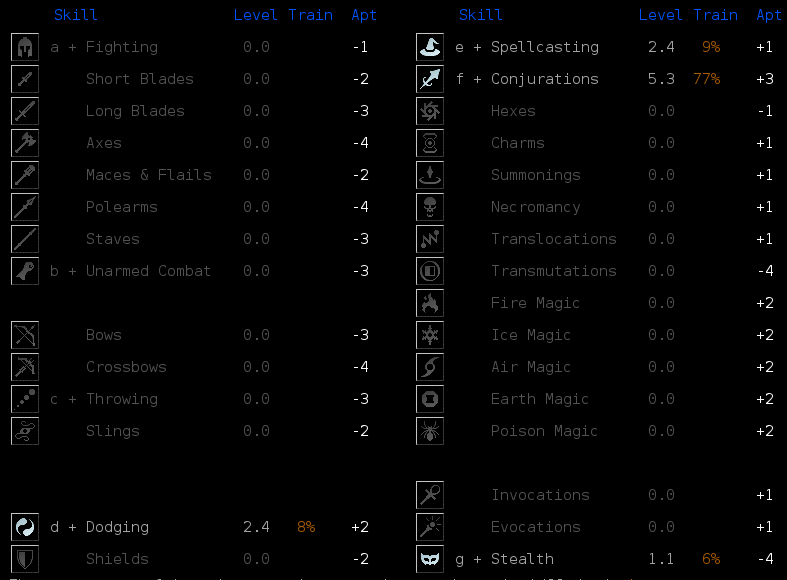 I'd like the species with something closer to chequer's suggested aptitude layout and somewhat better hp and/or ac. Still bad, but not "even more fragile than a spriggan". If the character is squishy and has to manage MP eventually I could see difficulty arising because it's better to teach how to handle these things on D:1 than L:1. MP discounts making low level spells into cantrips is an interesting idea but I'm not sure if it makes a race easier to win with. I'd contrast it with Sif, who similarly lets you cheat at MP management but doesn't lose effectiveness in the mid and late game. I'd currently consider GrEE the easiest caster combo to learn. It's poison immunity, AC bonus, and natural GDR negates earlygame killers like adders. However, Gargoyles will always be immune to poison and always have more AC/GDR than a standard caster so it doesn't matter if the player never learns to play a squishy, poison-vulnerable character. Similarly, earth magic is easy for new players because while it's not the most damaging there's no need to plan around resistances. If you can get iron shot then you're set for killing OoFs on Z:5. What were everyone's hurdles when learning to cast? The big one for me was the sheer number of spells. You have to think about how to counter different enemy types and positions and you'll get a different spread of spells each game. I spent too long looking for damage/accuracy numbers trying to make comparisons. I know a friend bounced off the game a couple years back due to picking HuNe (this was before races were marked Simple/Intermediate/Advanced). There's also a counterpoint to my own fail-fast argument that dying 10 times on D:1 in 10 minutes can be more discouraging than dying 10 times on L:1 in 10 hours even if it represents less lost time. Thank you for the responses and gut-reaction feedback so far. I'm convinced on some points enough to make some changes, and some other things (like whether mana regen or significant +% mana are necessary) I'm less sure of and would like to hold off until more people get a chance to actually play it. Isn't Draconian already a species under Simple that's well-suited to killing things with spells all game? duvessa wrote: Isn't Draconian already a species under Simple that's well-suited to killing things with spells all game? Indeed, Draconians are "versatile hybrids" and are certainly capable of being focused primarily into spellcasting if a player so decides. But, there is nothing currently there that directly speaks to that fantasy and guides players into those experiences. I'd like to think there's room for such a species to exist, and also that it's desirable to have. Although that is at least in part predicated on the notion that there is also room for, and it is also desirable to have, a species with traits that make some of the more initially troublesome parts of that experience simpler or easier. Yes, and both hill orcs and minotaurs also exist simultaneously. It is indeed and I always recommend to noobs that they try out magic with a Draconian. But, almost every time, they choose to play Deep Elf instead of Draconian. Why? I think it's because DE is so obviously a magic-oriented species. Something about that seems to be more appealing: "I'm learning magic so I need to pick a magic one!" I suspect that if you made a Simple but obviously magic-oriented species it would have the draw for noobs that DE does while (if you design it correctly) not being as punishing to learn with. Right, but it's simpler to tweak Draconian or DE. As has been pointed out, this species shares its theme and most of its attributes with Dr already, and the remaining attributes (HP, stats, aptitudes) are pretty much DE's without bows or stealth, and stealth isn't good on conjurers anyway. I also think DE belongs in Simple more than this species does. You've got seven mutations there to DE's zero. The species shares DE's weaknesses with the addition of no armour. This is very much more complex and harder than deep elf. If you moved DE to Simple and gave it this MP cost reduction mutation, it seems like it would accomplish the goals better than this new species would, including the "fantasy" aspect - assuming you associate elves with magic. I do agree that it would be much easier to throw Deep Elf on the Simple list, and/or just give it the MP cost reduction, and call it a day. It may be that one or both of those is ultimately a better path (though current Deep Elf is a great species and I think is placed appropriately). But, I do not agree that the output of the above proposed is harder, especially through at least about lair or so. I've been worried more about the opposite really, because starting with 6ac/20ev/6sh and 0.9move has been suspiciously good during the first many dungeon floors, even with the noted shared weaknesses. Certainly there are more words under 'mutations', but I also do not agree that more words in all cases translates to more complexity. For example, consider whether or not net total complexity is higher as a result of lacking of body armour, or if (yes, taking a page from Draconian,) it's simpler to remove the trouble of figuring out the cost vs benefits of encumbrance and an armour's rating + armour training. Further, although MP cost reduction also adds more words to the 'mutations' page, it's a passive ability that serves to put training wheels on the lowest level spells and smooths out that experience. At first blush the species may be a bit harder for a player to wrap their head around, and if that's the angle at which you're evaluating complexity then I concede the point, but even "you have less stealth and aren't very good at stealth" sends the message to not worry too hard about it and thus simplifies gameplay, as where it might be more muddied on DE... and like you said, Stealth isn't that good for a Conjurer anyway. FWIW Duvessa, I appreciate the discussion and ultimately I'm offering my (probably sometimes skewed) perspective much moreso than intending to be combative. Coincidentally I am playing a DEWz of Chei at the moment. I haven't found any decent books in Lair/Orc/d1-15 but I obtained a vampiric morningstar. And you know what? I equipped a middle armour and almost got the morningstar to min delay despite -3 aptitude. 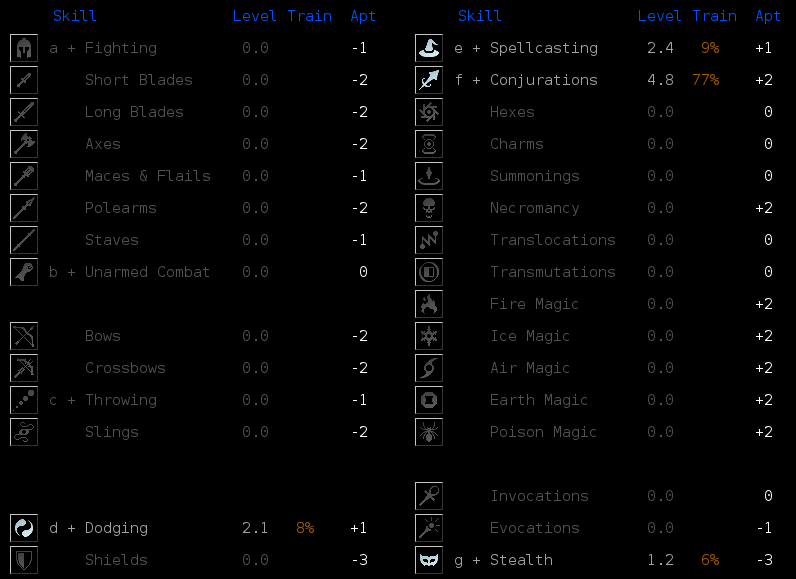 Now I hope to find a good heavy armour and probably will cast spells even less often. Would it be possible to survive such bad luck with new species? I think it should. Realz: have your friends played DE or Dr mage-type characters, and if so, how was their experience? Lack of brands on armor/gloves/boots is unfortunate for lategame (and even deep elf will certainly have much more AC by then), but the ancient power of Walking Away Quickly is so good that I'd easily take this over DE for a first caster win. Much easier time with the earlygame makes getting something rolling less frustrating. I can ascend melee guys just fine, but I've been struggling with casters. If I could just survive long enough to get a strong spell online... a species that specializes in doing just that, sounds good to me. edit:All that being said, draconian is still probably easier with +10% hp and actual AC <_< But, a tiny agile casting species does sound fun to me. I like OP's proposal - spellcasting tabber sounds fun! At least it's not *yet another* race proposal with -1 to everything to make it "balanced". kuniqs wrote: I like OP's proposal - spellcasting tabber sounds fun! It is not a tabber unfortunately. Djinn (spelling?) was a tabber but it didn't make it into the stable. I like the reduced MP aspect of the proposal. It really lets you use level 1 spells as bread and butter without worrying about MP. Other spell casters, for example, benefit from using slings for fodder. Lets you save MP and a spell slot for actual threats or even regenerate MP for free depending who you are worshipping. Againt it was my own idea so I am biased :p. But I think higher spell noise is more significant than any stealth modifier, because it actually affects spells (you are not going to walk up to anything to stab it with this race, are you?) and because it affects stuff out of LoS. It emphasizes the extremes of magic aspect of it. You also have to consider the race size. A race that size already has good defense, keep that in mind. I also think flying is a bit overused as a race intrinsic currently, and a bit too exploitable for a race so centered about ranged attacks. If you need to control space better, I would suggest a rather awkward but more unique intrinsic. When damaged, Faeries drop a cloud of Sparkle Dust on their position. If they move they will drop another depending on the damage taken. Enemies that walk through these clouds get slowed down (but only while they are inside it). As you level up the the Sparkle Dust cloud upgrades to a temporary cloud trail upon taking damage, and then to a permanent one. Pretty weird, but unique right? Its extra complexity for sure, but at least it doesn't force you to use the "a" button. Realz wrote: But, I do not agree that the output of the above proposed is harder, especially through at least about lair or so. I've been worried more about the opposite really, because starting with 6ac/20ev/6sh and 0.9move has been suspiciously good during the first many dungeon floors, even with the noted shared weaknesses. Oh, I didn't realize it had 9 move delay. I noticed the manual entry said they were faster while flying, but the mutations didn't indicate any increased movespeed so I assumed it was a feature that got shelved. I do not think another fast species is a good idea. The plurality of monsters are still speed 10, so you just end up with a lot of kiting. As for body armor, conjurers pretty much always want robes and my experience is that new players pretty much always wear robes on spellcasters. However, that experience is anecdotal, so I recognize it's possible that the ability to wear body armour really is an issue. Keep in mind that Felid removes the better part of equipment mechanics from the game, is fast, and has friggin extra lives - very few species can claim to be simpler to play. Yet it's in the Advanced section because of how much it departs from other species. And it should be, because every departure from other species is another mechanical change to adjust to, even if it simplifies decision-making. I like the MP cost reduction mutation. It's fine balance-wise and it's a unique advantage for a species. I'm just not convinced that it needs an additional species to go along with it. It's a little concerning that casting Magic Dart would be strictly better than waiting/resting but you can fix that - for example, instead of cost reduction they could regenerate 1 extra MP per turn, which would accomplish mostly the same thing while still providing a reason to wait. Agreed that making the species bad at stealth makes stealth less of a newbie trap. But it doesn't need a mutation to reduce its stealth when you can just give it a terrible stealth aptitude. I admit it's hard to come up with consistent flavour for DE having a terrible stealth aptitude - all I can think of is "elves are so pretty that everyone notices them". Maybe just removing the starting stealth skill from the Mage backgrounds would be enough? I didn't mention the +6 AC and SH because that's just a raw power increase, and raw power increases are trivially easy to make. If you want DE to be better early in the game you can give it some extra EV or HP or AC just as you did with this species. Deep dwarves have special tough skin, so can deep elves if that's needed. But I don't think it is. That mutation (and for that matter the MP cost reduction) is mainly about making the early game easier. It can be hard to wrap your head around as a spoiled player, but unspoiled players typically don't see the early game as the hard part. Will they have a very high pre-Lair death rate? Yes, but they'll play a lot of games, and it's the losses where they do reach Lair/Orc/Spider/Vaults etc. that really frustrate them because they're usually going to be a death to some unfamiliar monster or new gimmick they weren't familiar with (because they're unspoiled). They'd rather lose 9 games before Temple and 1 game in Depths than lose 10 games in Lair, because they're sick of Lair but haven't gotten sick of Depths yet. Early game buffs aren't what these players are looking for. If they were, demigod would be a lot more popular. Almost the entirety of the above reply resonates. The only thing I lean the other direction on is whether 9 move is a good idea (and even then I'm not 100% on it). The thought of Deep Elf picking up the MP reduction intrinsic plus a modest power increase (like HP penalty reduced to 10%), is really quite exciting and would match the mechanical desire reasonably well. But there are a couple reasons I didn't start there. For one, I really enjoy Deep Elf as it exists currently, and I would guess I'm not alone. I wonder how well it would go over had I instead made a thread titled "Buff Deep Elf and give it this mutation." I think it's a great idea, but such a change requires stomping on some legacy, even if it could theoretically be better in a vacuum. Second, the mechanical goals aren't the only reason for the proposal outlined above, and perhaps I made a mistake by not writing this under the "Goals" heading. The other half of the concept for the species came from a friend, to whom I asked, "What would you want to see added to crawl?" and she said, "FAERIE! Pretty! Evasive! Spells, pew pew!" And from there we got to Faerie Dragon and it matched extremely well with the mechanical goals being discussed. I realize not everyone may think "Species that looks pretty" is an important fantasy that crawl should represent, but I believe it has some merit and could be part of the discussion related to the question of whether or not a new species is warranted (two birds, one stone? ), or if simply something like Deep Elf should change. You can rename deep elf to fairy if you want. DCSS has a long history of getting rid of elves. Realz wrote: Second, the mechanical goals aren't the only reason for the proposal outlined above, and perhaps I made a mistake by not writing this under the "Goals" heading. The other half of the concept for the species came from a friend, to whom I asked, "What would you want to see added to crawl?" and she said, "FAERIE! Pretty! Evasive! Spells, pew pew!" And from there we got to Faerie Dragon and it matched extremely well with the mechanical goals being discussed. I agree with other people here that the lack of scaling is a big problem. +6 AC and +6 EV is overpowered early, but lack of equipment costs ~20 AC and ~3 resistances later. It seems to me that the solution is simple: a larger, more human-like faerie - basically a human adult or child but with wings. Flight could give +4 EV but 0.1 slower movement while active. And yeah, you could also make the waiting point about ranged weapons. -1 MP and fixed defensive mutations work great for all of these elements. Carefully picking aptitudes (like a poor stealth apt, and poor apts for non-magical ranged options) will also work well. I do agree that Draconian is a species in an uncomfortably similar design space. But it's also true that new players typically ignore Draconian, perhaps because it's superficially too complex with the random evolution and breath weapon. If this proposal wants to build a more "newbie attractive" version of Draconian, perhaps you could either make it a rework of Dr, or also talk about moving Dr further away from this design space (eg making it a more advanced species). I'd love to actually give this thing a go. Realz, could you put it up somewhere? Ultraviolent4 wrote: I'd love to actually give this thing a go. Realz, could you put it up somewhere? I'll try to figure out how to do this tonight (I'm west coast USA), so within ~8hrs or less from this reply. If anyone has guidance they'd like to offer in that regard (or links/resources to point me to), I'm all ears! Given the sentiments in this thread, I'm going to back off a bit on worrying the species will be 'too good' until I hear back from players. So I'm going to up them to 'small' size instead of 'little', which will give access to all armour except body armour, and hats-but-not-helmets (and with the same weapon/shield restrictions as a Halfling which is the same size). Minor tweaks are easy anyways, so if we have to pull back later, we can do that. I do want to reiterate though that, for now, the intention is to be notably better and have a smoothed out experience early-to-mid game, and later on in a game to be about the same power as anything else you could play. If you're on Windows, I used the MSYS2 instructions and they work great for me. For large changes: Search for something similar to what you want to implement that's already implemented. For example, try searching the code for every place FORMICID appears. You'll quickly be able to narrow this down to a list of files you need to edit for your new thing. For small changes: Find an in-game message related to what you need to change and search for it. For example if you wanted to implement the effect of your -1 MP mutation, you might start by booting Crawl, writing down what the message is for not having enough MP to cast a spell, then searching for it. Fork the Crawl repository. https://github.com/crawl/crawl This will put a copy of the entire Crawl codebase under your own Github username. Using Github Desktop, open your forked repository locally. Make whatever changes you want to. When you're done, commit them and they'll be visible online. You'll even be able to make a pull request, allowing the developers (should they accept your changes) to quickly copy over all changes you made to mainline Crawl. If you have any more specific questions, don't hesitate to ask. Of the current races I'd say there are three archetypes for newbie casters: the wizard (DE), the reaver (Te), and the tanky caster (Dr and Gr). DE has the most int (on average 8-10 more than the others) and the widest variety of spellcasting aptitudes. An elf can cast anything they find with minimal investment. However, this may not be very helpful to new players as taking advantage of it requires mastery of Crawl's myriad of spells and in exchange DE is the most fragile race of the four. Te is easier to learn. The aptitudes it loses are ones new players wouldn't be able to take advantage of and Conj 3 makes them the most powerful conjurers in the game, more than making up for the lost int. In exchange, tengu get significant defensive and melee apts and permanent fast movement, allowing them to recover from mistakes. Gr is the easiest, as it strips magic down to the essentials (Conj, Earth, Fire) and in exchange gets solid defensive/melee apts and the most powerful innate defenses in the game, getting GDR and more AC than a draconian and elemental resistance to most forms of YASD. I get your point that without reading a guide or lurking in chat it's unlikely for a new player to figure out that gargoyle is the easiest newbie caster. Most of the familiar [T*lkien] races (human, elf, dwarf) are newbie traps. I've previously though about a "tutorial sprint" that provides a scripted vertical slice of the game. So you pick "Tutorial Sprint 1 (Melee)" and it teaches you to pick MiFi. On D:1 you learn to fight and explore, find an altar of Okawaru, pick up armour to complete your body slots, and find a staircase to L:1. On L:1 you use heroism and a mace to kill a hydra, quaff a potion to kill a tough unique, and find a staircase to Z:1. 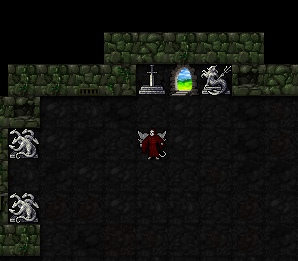 On Z:1 you use an executioner's axe and all of your abilities/potions to kill and OoF and take the orb. There'd be scripted encounters where you have to use blink to escape with low health and teleport multiple times to get out of danger. Then you pick "Tutorial Sprint 2 (Magic)" and it teaches you to pick GrFE. 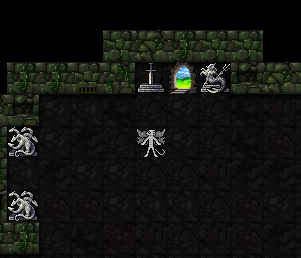 On D:1 you work your way up the starting spellbook and find an altar of Sif. On L:1 Sif gives you fireball to kill a hydra and iron shot to kill a red dragon. It ends on V:1 where you use shatter to clear a vault guard ambush and take the silver rune. Is your patch online anywhere Realz? I think the easiest newbie caster is deep dwarf, not gargoyle. I do not think regenerating 1 MP every 10 aut would be broken. Maxwell's Etheric Cage offers 0.5 MP every 10 aut on average, and it's a useless piece of crap. Sif Muna lets you regenerate much more MP than 1/turn, and the ability is barely useful (largely because of how late you get it, but still). The main implication is that you won't run out of MP in the early game...but reducing all MP costs by 1 would also mean you won't run out of MP in the early game. Changing it from -1 mp cost to +1 mp regen... well it's certainly stronger, helping cement it as "species of heavy MP flow". 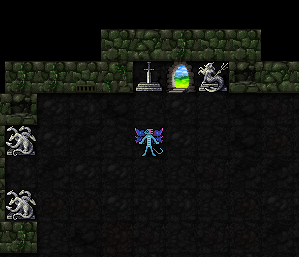 Just backing up a few tiles would let you cast another lv4~5 spell almost instantly. That's a pretty big boon in early/midgame, especially for newbies who are more likely to be carelessly burning through mp. Although it does sound like it could give the race absurd summoning potential; all the summon has to do is last long enough for you to recoup (most) of the mp cost, and you can just -keep summoning more-, winning through attrition. chequers wrote: Is your patch online anywhere Realz? Edit: I forgot to change mentions of size in the manual and such from 'tiny' to just 'small' but hopefully that's no big deal for now. Let me know if you see any glaring issues? Last edited by Realz on Saturday, 17th March 2018, 21:12, edited 1 time in total. except instead of Patashu it's your Github username. If it doesn't exist, you didn't fork Crawl yet, so do that first.